Is your dog a runner? 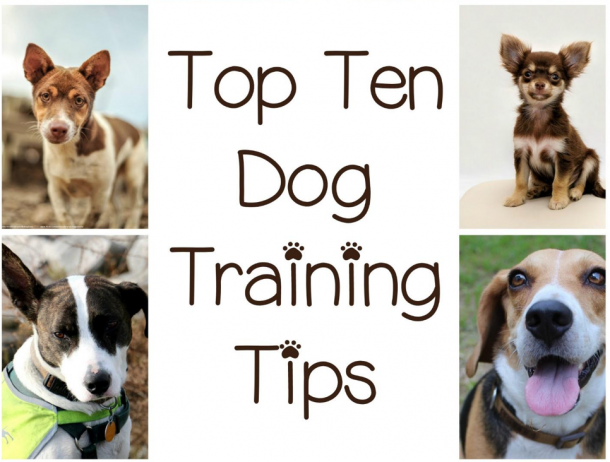 If so, you might need these training tips to keep your dog from running right out the door! My older dog, Gracie, is one of those dogs who stays right by your side, even if she’s not on a leash. When she runs out the door, I know she’s not going anywhere, so I don’t give it a second thought. I didn’t realize how spoiled I was until Lucy, our almost two-year-old Golden, came around. Lucy bum-rushes the door, and when she gets outside, she plays a maddening game of keep-away while we run around looking silly. I had to figure out how to get Lucy to stop running out the door, and fast! If you have a runner like I do, give these training tips a try to keep him from scooting out the door every chance he gets. Create a physical barrier. This one isn’t revolutionary, but it’s important to mention. If you live near a busy road (this is me), the woods (me again! 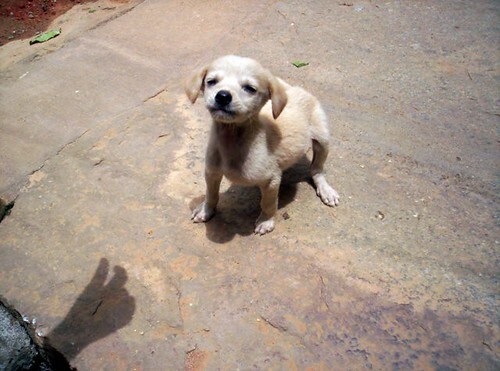 ), or have other dangerous surroundings if your dog were to get out, you may want to look into a physical barrier for complete certainty that your dog will stay inside. 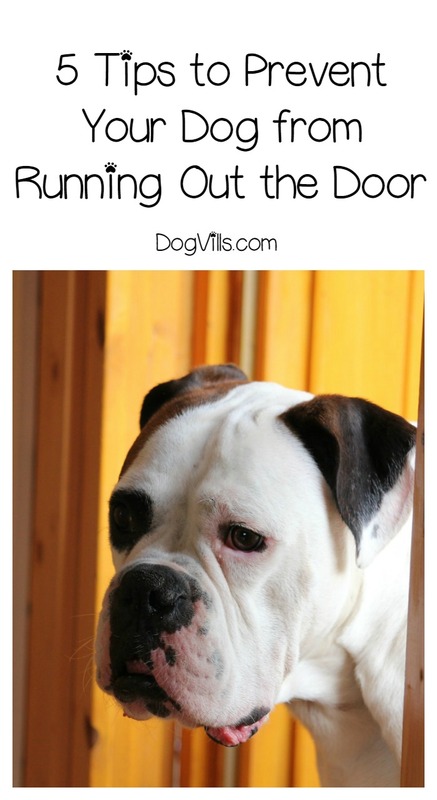 Whether it’s closing her into a separate room, crating her, or putting up a gate (that she can’t jump over), there are several different ways to guarantee she will not get out if the door opens. Mat-train your dog. The idea behind mat-training is to create a space (a mat is a good boundary) near any door where your dog is expected to sit and wait rather than rushing up to the door. Start by getting your dog familiar with his new mat and asking him to “sit” and “stay.” Give him plenty of treats and praise when he obeys and firm redirection if he doesn’t. Slowly move closer to the door, repeating the sit and stay commands, until you are able to exit the door without him moving. Each time he gets up, say “No!” and start over. Be patient and train in small sessions so neither you nor he get discouraged! Enlist a little help. There are all kinds of dog products out there these days, and there are several highly-rated training aids to discourage negative behaviors. Look into the PetSafe ScatMat or PetSafe Pawz Away Indoor Pet Barrier to help you reinforce the door as a no-no zone. Teach the wait command. If you want to use this command, it’s necessary to use it at any entry or exit, including the door to a fenced-in yard, the crate door, the front door, and even interior doors separating rooms in your house. The goal is that your dog will look to you for direction any time there is a door. Train in the same manner as mat-training, with repeated attempts until mastery is achieved. I also have found that starting the wait command with mealtime is helpful; once your dog can wait to chow down, you will find her to be more receptive to waiting at other times. Be consistent. Whichever training route you choose, it’s important that you not waiver. If you’ve decided on mat-training, your dog must sit on the mat every single time – otherwise, he will get confused and training will take much longer. This can be challenging if you’re late and are rushing out the door, so advanced planning and an overall commitment on your part are critical. 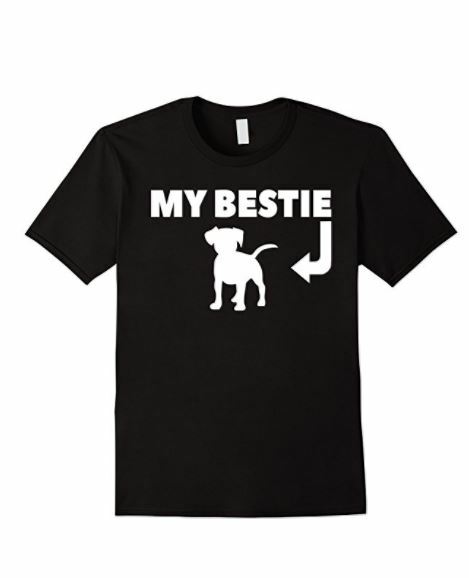 Before long, your dog (and you!) will get the hang of it, and you’ll be relieved at how easy it is to leave or enter the house without your dog trying to do the same. Trust me – it’s worth it! 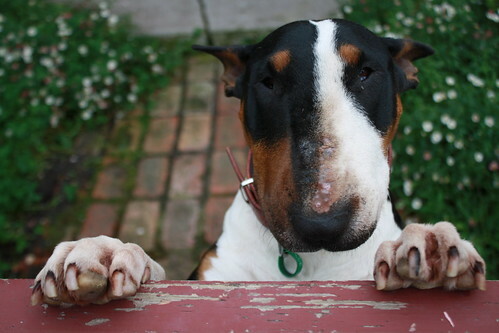 Have you used any other dog training tips to keep your pooch from dashing out the door? Share below!